Went to yoga tonight after work. We had a substitute who was.... well... okay. She made the mellow Sandy seem like a firecracker. Apparently the sub (never caught her name... ) doesn't teach a lot of classes any more, but she leads groups and works with a lot of people with chronic diseases. Which perhaps explains the air of calm she exudes. I did love the way she rang bells at the beginning and end of practice.... and I actually nodded off more than once during the "deep relaxation" portion of the practice. But I don't really feel like I stretched anything. Went to my second Zumba class today... or tried do. Got there to find a different teacher than last week. Okay, no big deal. She was cute and perky and very sweet. Two other women arrived, including one who had been in class last week as well. It seemed a little weird that the music the teacher was playing before class started was so different to last week -- but I figured that instructors make their own mix of music. She started off by telling us that she was going to do more of a hip-hop feel.... with some isolations to really feel the movements. I thought, well, okay, maybe this is normal. The instructor stopped after 15 minutes and the other woman said that she really wasn't getting it -- that she doesn't have any dance training, so she gets really frustrated by trying to do the moves... that she likes Zumba because it's a lot more free and loose and she can just keep moving. She looked somewhere between upset and angry, but was trying to stay friendly. The instructor said, "Oh, yeah. That's really great feedback" in that voice that calm, connected, right-on people use. :) I piped up that it's only my second ever Zumba class, so I was just trying to get my feet in the right place. The instructor said, "Okay, then, let's just move a bit more." Then for a few songs she did simpler -- albeit weirdly slow at times -- moves, and I got a bit of cardio in. Then she went off on another idea -- what we should "disconnect from the mirror" and "focus on percussive movements" and "imagine we're in tubes, where we keep bouncing off all the surfaces". The other woman and I gamely tried to move around, but she and I made eye contact and it was all we could do not to laugh. I fear the instructor noticed our desultory "percussion" and said, "Ummm, okay, let's get back to these movements." And from then on, she kept things simple and we were moving around again. Every time we got through a song she would clap her hands and say, "Yay!" I was surprised to have her shift to what felt like a cool-down with 15 minutes to go. We did spinal stretches, then a series of yoga moves, planks, and then even some floor work. Umm, how did this happen? With 10 minutes to go people started coming in for the 6:30 class and stared at us as if they, too, knew something had gone very wrong. I was super relieved at 6:30 when she announced class was over and thanked us for all of our work. I smiled, said, thanks, and then tried to get out of there as quickly as possible -- though the other woman was faster. I walked up to her outside -- where she was chatting with a friend -- and said, "Umm, sorry to interrupt, but... was that normal?" She laughed and assured me that it was not -- that tonight's instructor was a substitute who usually teaches hip-hop or NIA. Her friend said, "I got the time messed up and walked in at 6:20 and couldn't figure out why you were all on the floor...."
Apparently all of the other Zumba instructors are great -- that sometimes you just get unlucky. After all, as Wil pointed out, what would have been more frustrating for me: that I had a weird instructor, or that class was cancelled? Anyway, I did get a bit of a workout (though not the killer workout from last week). But I'll be back next week! Sunday morning we were both feeling a bit sluggish... but got up and resolved to go for a long walk -- up to the lookout, down to Golden Gardens, across the Locks, around Discovery Park (and past the lighthouse, geddit? ), and back across the Locks to Ballard. The weather wasn't particularly great, and we didn't have much energy... and my hamstring kept bugging me. When exactly will this end? Anyway, we went for a brisk walk, got rained on a bit in the park, but made it to the Market Arms before the real rain hit. Another weekend, another half marathon... that's 12 for the 40@40 project! Wow -- really excited to see this! Seriously -- I have gotta stop doing these back to backs. But, hey, how can I resist the chance to pick up another state? I was feeling really nervous pre-race -- it's a small race, and I was planning on walking the whole way. But (as noted earlier), the swag was really nice -- especially the shirt! The race started a few minutes late -- long lines for the porta potties and only gun timing meant they wanted to give people a chance to get in the start area. I lined up at the very back -- I'm nice that way -- and I stretched my hamstring a little. I chatted with a woman named Vanessa, who was running her first race. She was nervous but I promised her she would have fun and finish strong. The runners took off and I headed out behind them. I quickly passed a group of four women -- one said, "Well, I've walked 8 miles before, so I should be fine"; to which another replied "yeah, we've got four hours." I slid in behind two other women who were walking very briskly. After leaving the factory, we followed two-lane roads through the countryside. On the first (and really only BIG) hill I decided that I didn't want to spend the next three hours trying not to eavesdrop on the women in front, so I kicked it up a notch and passed them. One of them said, "Oh, no, we're being passed!" and laughed. I said it was my turn to lead for a while -- that they could pass me again in a few minutes. Weirdly enough, I never actually noticed them again. We passed the Whately Inn and a pretty old church. An elderly lady was sitting by the road with her family, and said, "Oh, these must be the walkers." I said, "I guess that means that I'm not lost, then!" and she smiled at me. At some point I passed two more walkers -- so there were now 8 people behind me. This made me feel a little better. As I headed up another hill, I started getting close to a woman who was running a bit, then walking. As I passed her, I said, "How's it going?" She looked at me and started running. Okaaayyyy... But to be fair, she must have overcome whatever had been making her struggle at the beginning of the race, because I never got that close to her again. Ah, the powerful motivation of being passed by a walker! I tried to keep up a brisk pace, even daydreaming a bit about trying to walk a sub 3. Ha. The ile marks were bright green paint on the road, and there also indicated the way. I have to admit, sometimes I worried I had lost the way, even if there had been no turns. But all actual turns WERE marked, so I needn't have worried. Over hill, over dale -- past farms, fields, pastures. It was lovely and quiet and peaceful. Somewhere around 9 miles I saw three women talking at the side of the road. They noticed me and two of the quickly said goodbye to the third and started running. They ran for a while, then dropped to a walk again. When they did, I rapidly gained on them. I would get close -- like within a few feet -- and they would take off again. This went off for a mile or so. Seriously. Their walking breaks got longer, and eventually on one of them I just sailed past them. We said hi, and I never spotted them again. They were probably relieved to have me off their back. If you are keeping track, that's now 10 people. The walking was really easy, by the way. I did keep moving quickly, but I focused on just walking steadily and trying to stay relaxed. At mile 12 I spotted two more people. They appeared to be running, but they weren't moving very quickly. I set my sights on them and slowly but surely reeled them in, too. As I passed them, the two women split up and one of them started walking next to me. She said, "Oh, you're walking..." I smiled and said yes, and then she asked if I had walked the whole way. She clearly didn't believe I had. As we went up a slight incline she couldn't keep up, which was fine by me -- I didn't really want to chat. So I wished her a good race and dropped her. Yep, that's 12. The last mile was pretty uneventful. I passed the factory, crossed the overpass, and went down the little hill to the finish. As I neared the end, I passed small groups of people, some of whom had apparently only finished a few minutes ahead of me. Nice. Got my pretty medal, some water, and a banana, and walked back to the car while cheering on the folks who were finishing behind me. I didn't feel for at all, and I bet I reduced the soreness I would have felt from the previous day's run. This was a super cute run -- nothing big or fancy, but nicely organized. Obviously not my best performance, but just fine in the end. I got to spend some time in the sunshine in rural Massachusetts; it gave me an excuse to visit Historic Deerfield in the afternoon; and, most importantly, it gave me state #14!! A slightly wobbly national anthem -- it's "o'er the land of the free", not "in the land of the free", but hey... -- and for the first time ever, people all started running at once. Not run a few feet and then stop and start again when you get to the starting line... Just "go!" and everyone started running. It was almost shocking. We ran along a little back road for a mile, before arriving at Winnepesaukee proper and passing the finish line. (A man near me said, "Wow -- I just PR'ed!") Then we just ran and ran. Anyway, not much to tell -- long hill between miles 3.5 and 4.5 up to a ridge with some nice views, and eventually a steep downhill stretch to the lake. Running was okay, if a little gimpy on the uphills (where I did more than my fair share of walking, but who cares). Downhill was so steep that I had to sort of carefully pick my way down the bumpy road. Then it got a little weird. I was approaching a water stop just before mile 10. As I ran up to it, I thought, "those kids are really far out into the road". The road was better paved, but still pretty narrow. And the kids were several feet away from the table at the side of the road. I had picked up a cup of water from one kid, but wanted Gatorade as well. I made eye contact with a man dressed as a nun -- he was saying "water" so I moved a few inches to my right to avoid him and hone in on the kid next to him, who was saying "Gatorade". As I shifted, the "nun" made a weird face, and I felt the whoosh of a car right next to me... and it just barely clipped my right elbow. Now, the driver wasn't going particularly fast, and the road wasn't particularly wide, and I'm sure he didn't realize that he had clipped me. It was just enough to bump my arm forward... AND COMPLETELY FREAK ME OUT. The "nun" and I looked at each other, wide-eyed, but I just kept walking while clutching my cup of water and willing myself to breathe. Very weird. The rest of the run was pretty much without incident -- even though I essentially walked the rest of the way in "to save my legs" (ha ha). Nice support at the finish line -- lots of runners wearing their medals and cheering. Got a little shout out (people are always excited by out-of-towners), a really pretty medal, and a bottle of water. Walked around a little bit -- deciding that the line for race food was too long and too slow-moving, but stretched in the sun and then climbed on a shuttle back to the start. On the way back to my hotel I stopped in and got a double scoop (yeah, you heard me, DOUBLE SCOOP) of amazing ice cream. Paying $3.80 to buy my own was WAY smarter than standing in line...). I liked the race, I liked my fellow runners, I liked the area. But I do have a few comments. There were a few amenities promised but not delivered on. I am almost hesitant to mention them, mainly because none of them were things that matter to me. But for some people it does matter, so here goes. 1. "multicolor technical tee" -- this was actually a nice cotton t-shirt. I don't mind a cotton t-shirt. To be honest, I'm not going to wear it anyway. And a cotton t-shirt is better than an off-brand, cut-rate "technical" shirt like you get at some races. (Run Like Hell Half Marathon, I'm talking to you...). But if it mattered to you, you might be disappointed. 2. "digital split clocks every mile" -- I'm not sure there were digital split clocks anywhere on the course. Again, I have a watch, and the miles were marked. I think most people have watches, so maybe no one cares, but if you expected to be able to track progress, you might be bummed. 3. "The Whole Course will be a party, too, with live entertainment throughout!" -- again, though the folks at the aid stations were friendly, helpful, and often blaring music, it wasn't really "live entertainment". Do I care? No. But someone might. There *WAS* music at the finish line, with lots of people hanging out in the sun. And now, for some nice(r) comments! The medal was gorgeous, and had one of the best ribbons ever. Great placement of the race name on the back -- so when someone had the medal on, you could read the race name at the back of the neck. The volunteers at the aid stations were super nice, and I especially liked the ones with all the kids in superhero garb. The post-race food looked good -- but I didn't have the patience (or time) to wait in the long line. Feeling pretty dumb for doing this. Have decided to walk, start to finish, and seriously rethink this back-to-back nonsense. Still, this little race has a lot going for it. 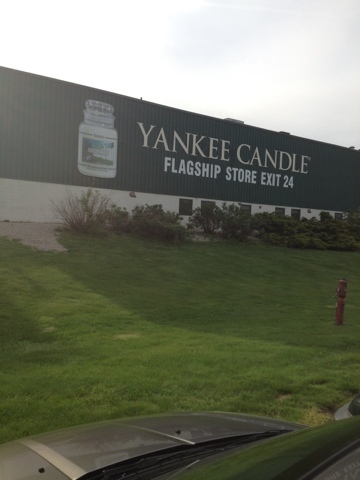 One, it starts from the Yankee Candle Company factory. So it smells very fragrant. Two, it has the second best race shirt I have ever received. No, wait, make that the best. A BLACK North Face technical tee. Women's. Sweet. Third, I got socks, gel, and a Yankee Candle air freshener in my goody bag. I am having that "oh, no, I am going to finish last" worry. Which is a little dumb, but. Someone has to come in last, so why not me this time? Yesterday I saw a woman in her W.I.S.H. top and was reminded that DLF > DNF > DNS, so I am trying to remember that. Have decided to wear my PureCadence shoes today. I have walked 13.1 miles in them before, so hopefully I will be fine. Tacoma is hilly. Who knew? But I'm getting ahead of myself. Really great to stay three short blocks from the start/finish line -- it meant we could get up, have a leisurely breakfast (bread and peanut butter for Wil, bread and cheese for me), and gaze out the window at the marathoners streaming toward the start. We couldn't actually SEE the start line, however, but I could hear the national anthem, the whoop of the crowd, and the air horn sending off the runners at 7:30. Meanwhile, we dawdled. I tried to decide whether or not to wear a jacket (glad I did), arm warmers (meh... could have skipped them). Wil and I were both decked out in club regalia --Wil sporting the gorgeous sublimated singlet, while I wore a new skort (Brooks PR Skort, of course!) and my club shirt. Oh, and the arm warmers. I must have been insane. Thus attired, we headed down to the starting area around 7:45. Not much to do there but mill around a little, admire all the Fanatic gear, and try to stay warm in the shade. The morning had started relatively clear, and it looked as if it would brighten... but it actually fogged over a little, and the first part of the race was run in the mist. Luckily, it cleared up when we were along the waterfront in the middle of the race, and stayed sunny (but not hot) after that. With very little to-do, and only moments after Wil looked at his watch and said, "Well, it's 7:59 -- they should be starting soon...", an air horn sounded and we set off. A little crowding to get across the timing mats, but then it was open sailing. Of course, with my hamstring and Wil's Achilles, we had seeded ourself at the back. The course seemed to meander a bit around the convention center for the first two miles -- I got the feeling the course was just trying to go up the hill in stages, and also burn off some miles for the marathoners. I'm always surprised by how empty downtown Tacoma feels -- how much vacant property is so close to the downtown core. Then as we approached mile 3, a bit of a surprise -- the very pretty Wright Park, complete with majestic lions at the gates. We then ran through a neighborhood of nice homes. Who knew? Back towards the start again (more miles, I'm guessing...) and then down the steep hill to Ruston Way. It's not surprise that our fastest mile of the race was mile 7 -- we were just streaming downhill. A bit of a breeze picked up as we hit the water -- I kept hoping it really was a headwind and that we'd have a nice tailwind on our return journey. But the sun had come out by then, and we had a nice run down the boulevard. We had started seeing people on the return journey as we first came down the hill -- and by now we were seeing the main pack. For some reason, the "prevailing side" switched over at some point -- we had been staying to the right ever since we saw the leader... but for some reason the runners coming toward us had shifted over to the right. So we shifted over to the left... only to have to switch back again later. Very strange. We happily hit the turnaround (hooray for timing mats keeping everyone honest!) and headed back. Things get a little hazy around now. I got a massive cramp in my hamstring, and actually had to stop and stretch for a minute. I needed more walking breaks than usual, but Wil did a great job of keeping me moving. As we approached the ramps back up to downtown Tacoma, around mile 11, we just decided we would walk the uphills. Up, up, and up we went. Even when we thought we had done the last hill, we hadn't... but the very spirited volunteer at the mile 12 marker kept saying "I'm at the top of the last hill! It's honestly all downhill from here!!!" With a mile to go, we made our way back along Fawcett Ave., and hit the final turn. As we did, I saw a man on a bike, closely followed by a man running. It eventually dawned on me that he was the marathon leader, coming in to the finish. We got to the finish chutes -- where I saw a guy walking in the marathon chute... and thought "he must not have read the sign", thinking he was a half marathoner. But apparently he was running the full, and just needed a minute. Strange. We headed back to the hotel and up to the room to shower, then headed home. That's 9 out of 40! Since there was no race-day packet pickup, in order to avoid two Tacoma trips in two days we decided to book a room a the Hotel Murano, the host hotel for the race. As we got in the elevator, a woman looked us over and said, "leopard print luggage, long hair... You must be here for the concert." "oh... Nope. Tacoma City Marathon." It has been interesting, seeing the culture clash in the hallways and elevators. Went to the expo, picked up our packets, and then got some Fanatics gear to wear tomorrow. Later we had Mexican food (despite it being cinco de mayo...) and have then spent the evening hanging out in our very nice hotel room. Feeling tired but excited about tomorrow. But, um, what happened to that Heroes Half you were all fired up about? Hmmm? Well, see, it's like this. He finally went in to see the doctor (sadly not our awesome doctor) on Friday -- she gave him some nasal sprays to clear the blockage -- but the pain and headaches continued. It wasn't until we were able to see our beloved Dr. Deans on Monday that things got better. Wil and I prepared to run. We laid out our things the night before, mapped out the route, looked at the parking. Wil was being very brave. We checked and discovered that the race was "very walker friendly" which meant we could inch along as needed. On Sunday morning Wil got up and had a hot shower to try an limber up a little. He hadn't slept well, but was putting on a brave face. But it was no good -- it didn't make sense for us to grit our teeth and do it. I decided to call it -- we were staying home.